I am disinclined to start a new year with a list of resolutions. I lean more towards a general “all-year ideas and directions” than specific “New Year resolutions”. I know, I know, it’s simply a difference in timing. This may be just my silly self, but I feeling like I can never take the pressure of putting a definite list of goals (aspirations) out there. Like I am just setting myself up for the inevitable late-year scrambling to “lose-weight-get-organized-invest-wisely”. So I choose to quietly follow certain themes instead (for example – Simplify!) and I do this any time during the year, allowing for changes and adjustments along the way. So why am I even contemplating a New Years to-do list on this sunny-but-cool, gloriously-slept-in, pajama-wearing January morning? A list that I am foolishly going to share here, online, for all the universe (including aliens bored enough to check out out internet) to see? Why indeed? I have no answer but this – It’s 2011 folks and anything can happen! It goes without saying but I will go right out and say it – post more often! Explore new ways to share my love for food with more of you – I believe there are lots of people like me out there – regular yet fabulous people who strive everyday to strike a balance between home, work, and “me-time”. This year I hope to convince more of you that one doesn’t need to be a knife-juggling/pastry-making credentialed expert to create deliciousness in the kitchen…and that you can have fun doing it too! Use my cookbooks and magazines more often – I don’t own a whole lot of either. But I do think I should still justify their expense by using them more! Give my blog a new/updated look – I changed my blog’s design last year…from one blogger template to another. This year I aim to give it a more non-template-ish look. At the very least a new header! I am not a techie person by a long shot so this will take some doing and most likely outside help (who will work for cookies and Britney Spears impersonations). – Slice each croissant lengthwise. – Best egg and milk together in a flattish bowl. – Melt butter in a skillet. Place croissant slices in milk-egg mixture while butter melts, turning so all sides are coated in the mixture. – Once the bubbles subside lay each croissant on the hot butter, cut side down. Fry until golden brown and crisp on the edges. Flip and fry until the other side is likewise golden and toasted. Remove to a paper towel-line plate. 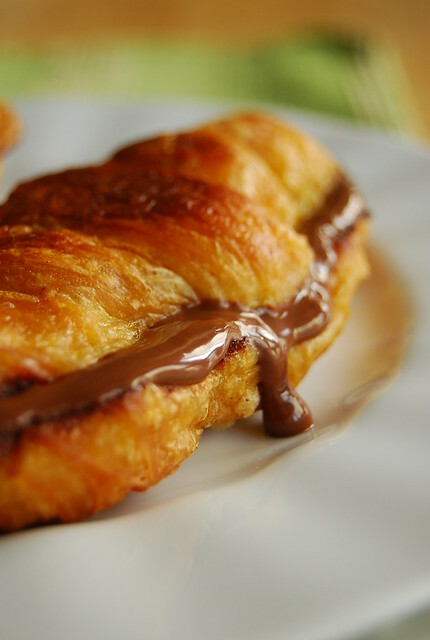 – While the croissant is still hot spread a good dollop of Nutella on each croissant bottom. Top with the top-half of the croissant. Serves two. Hooray! Good headway here on posting more breakfasts and using more leftovers I’d say. Aside from the obvious fact that January 2nd started on a very crisp-buttery-croissant-warm-oozy-Nutella note – one of the best ways to start any day of the year in my book. As for exploring new ways to share food with all of you…check out Yummy Magazine’s 1st issue for 2011! I hope you like what you see 🙂 It’s something I am very excited about! I think I'll just post a link on my blog to your resolutions… they're exactly the same ones I have vowed to make this year… especially to use my cookbooks and magazines more often! Happy New Year Joey – may 2011 bring you and your family lots of happiness. PS Beautiful nutella croissant… love the shot of the nutella oozing out. Yummy yum yum! How can you go wrong, starting the year with a breakfast like this? Happy New Year and looking forward to your breakfast fares. Cheers! Great resolutions! I hope you achieve them. Well in this post alone you've achieved more than one…and what a great breakfast it is! I love the drippy nutella. Thanks so much for the networking opportunity. Hope 2011 is great! Happy New Year, Joey! That croissant looks scrumptiously rich – perfect for pairing with a hot chocolate from scratch on a cold morning! "Post more often"! Yay! Thanks everything you post. Happy 2011. Hi Trissa! Haha, feel free! Yes, I buy these cookbooks and pour over them and bookmark like crazy…then there is a slowdown during the execution stage! Must get to all those bookmarks this year! Hi Mom-Friday! Thanks! Happy new year to you as well! Happy New Year Midge! That does sound perfect! Hi Marivic! Happy 2011 to you too! I am SO inspired by your newly organized office! I'd cleanse the palate after this gooey goodness with an apple. Instead of reaching for a glass of water, go for an apple by eating your water. I talk more about this on my blog, Glutton for Reward: http://gluttonforreward.blogspot.com/. Apples and nutella, by the way…divine. What a tasty recipe and perfect for starting the day with this. Hi Rachel! Go! It’s so worth it! 🙂 Nutella is an absolute essential in my book! Hi Anna! Thanks! Hopefully I can find some technical help to assist me in the “new look”! Hello Stefania! Happy new year to you! Hi Delphine! Thank you! It’s definitely one of my preferred ways to start the day! this is very sinful and very good, i'll try this. As to the resolutions… I'll just take yours, too! sweet! this is my kinda breakfast. I'm with you about using cookbooks I already have instead of just piling them on. Happy New Year, Joey! You know, make more breakfasts is on my list of non-resolutions too! I often just grab a muffin or have a piece of toast when I want to sit down and have something good to start the day. Here's to both of us achieving our goal(s)! Happy New Year! This looks *so* good. And I also want to try it with my homemade coconut walnut butter instead of Nutella… or almond maple butter.. so many possibilities! Hi Mary! Thanks so much for leaving such a nice comment! I am so glad to hear you enjoy what you read here 🙂 Wishing you a wonderful new year! Hi Veron! Me too! Hoping to make a dent this year! Happy 2011 and wishing all the best! Hi Lyb! I’m crossing my fingers for both of us! 🙂 Happy New Year to you too! Hi Hannah! Thank you 🙂 Coconut walnut butter sounds fantastic! So does almond maple butter…you are right, so many possibilities! Oh wow, I just happen to have nutella somewhere in my cupboard! Happy new year! So decadent this Nutella filling in my favorite bread roll: a croissant! Hi Talita! Thank you for your nice words 🙂 Glad you liked it! completely got me hooked at Nutella. Definitely will be making this and will be featured on our blog! i love the picture! its so tempting! Gorgeous! I could go for one of these breakfast, lunch AND dinner! My husband and I just went to Paris last month and much to our enjoyment, we found many stores sold nutella-to-go packages! Nutella on the run – YUM! Thanks for the idea and awesome photo! Cool! I am always a fan of anything Nutella. I like your photo as well.